I’ve been to Julian in San Diego’s mountainous East County numerous times in the last three decades, but had never taken the tour at Eagle/High Peak Mine, the largest mine in the Southern California mine district. I had tried once, but was a bit put off by a shaggy-haired curmudgeon who looked like he’d been around since the mine opened in 1870. The old man was nowhere in sight when we drove up to the mine on a recent Saturday and caught the last tour of the afternoon. We missed the first few minutes, in which our guide, Richard Liggett, demonstrated how to separate gold from earth. Then he spent an hour leading our group of about 15 through the dark, narrow tunnels (this is no tour for the claustrophobic), recounting what it was like to be a miner in the late 1800s and early 1900s. There actually are two mines — the Eagle Mine and the High Peak Mine — the latter begun when the claim on the former ran out. The tour takes you into the mine via the Eagle entrance; you’ll exit through the High Peak door. Liggett explained how miners spent hours of each day in near darkness, at first digging with only a pick, later blasting with homemade devices, then commercial dynamite. Sometimes those miners were 10-year-olds, but all who worked the mine were drawn by wages (paid in gold dust) that were much higher than could be earned elsewhere in the area. And if you got caught stealing gold from the mine, be prepared to accept frontier justice: bullets to the elbow and kneecap. Also fascinating were the systems of crude pulleys — buckets and ropes — that were used to hoist men and rock up and down the tunnels. The tour is not disabled-friendly; at one point, you’ll have to ascend a steep ladder. The tunnels, except for a few feet near the entrance, are reasonably well lit, and certainly a lot brighter than miners experienced. Back in the day, they had only the occasional candle placed at intervals throughout the tunnels. At one point, however, Liggett, with warning, turned off all the lights to give our group a taste of what it was like in the mine just after a blast. The force of the air from these blasts extinguished all candles, leaving miners in total blackness. It was an effective illustration, and most of us were relieved this demonstration lasted only a few seconds. The mine tour was an hour well spent, and Liggett was an effective guide. It’s safe to say that we all were grateful to exit and feel the sunshine once again. During our weekend in Julian, we spent two nights at the Pine Hills Lodge, a collection of cabins about four miles from the heart of Main Street. I’ve known about the lodge for years, but had never stayed there. Sad to report that I was a bit disappointed. For $165 a night, we had a small bedroom and living room with fireplace — clean but Spartan — and no housekeeping services. The towels were scratchy and the front desk was deserted by 6 p.m. For the same price or less, try the beautifully decorated, themed rooms at the Butterfield Bed and Breakfast Inn, about five minutes east of town. Included in the price are a gourmet breakfast, afternoon treats and a guest pantry. The owners are affable and gracious. Visit www.butterfieldbandb.com or call (760) 765-2179 or (800) 379-4262. The Eagle/High Peak Mine is open 10 a.m. to 3 p.m. daily except Christmas, New Year’s Day, Easter and Thanksgiving. The 60-minute tours are $10 for adults, $5 for children 12 and under. 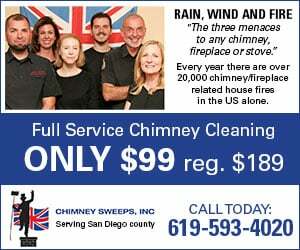 Call (760) 765-0036.